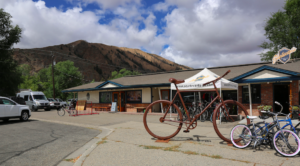 In the heart of downtown Hailey, just off Main Street and a few blocks from the Big Wood River is Club Ride headquarters. If you pop in to the shop you’ll likely be greeted by a big white Labrador, who takes her job as shop dog very seriously. Designated employee parking is in the shop’s far corner where a large mounted bike rack holds several mountain bikes. In the opposite corner, six shirts are neatly folded in black frames hung on the wall, indicating the unofficial hall of fame for original Club Ride gear. There are five desks situated along the shop’s perimeter, each adorned with stickers, photos, snippets from magazines and small mementos. 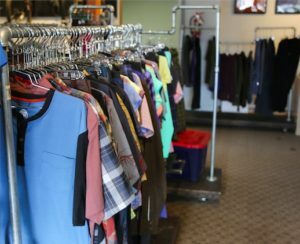 Several clothing racks fill the center, lined with button-up shirts, casual tees, long sleeve flannels, shorts and pants, all in different patterns and colors. The shop is unassuming. At first glance it looks like a typical office. The room is a large square with the exception of one corner that juts out from the building. In this nook, big ideas are underway. There is a large mirror in the corner and a dozen cardboard boxes on the floor brimming with fabrics, color swatches, shirts and pants. On the largest wall, collections of photos form three columns. The center column is made up of dozens of photos forming a collage. It’s reminiscent of a life-size Pinterest board. Up close, the photos don’t seem to correlate with Club Ride. There are photos of shoes, hats, socks, jackets and pants, patterns and color swatches, and stills of sunsets, trees and, of course, bicycles. On either side of the collage are printed photos of potential Club Ride products – men’s gear on the left, women’s gear on the right. Bits of fabric are pinned up next to shirts and notes are scrawled in the margins of the photos. A few of the products have a big “X” through them. This is the inspiration wall. It’s where every Club Ride product begins. It’s a side of Club Ride that most don’t realize. The team is keenly aware of tastes and trends, spending months formulating color schemes and mulling over potential product designs. They have to be aware and intuitive, given the timeline they have to work with. 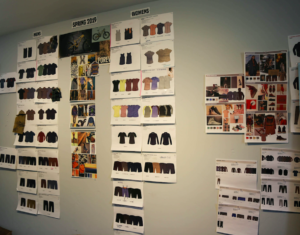 The inspiration wall has been housing its current display since October 2017 and is guiding design for products that won’t be on the market until next fall. The long timeline gives the company time to contemplate textiles, trends, and colors, and do a bit of testing before fully committing to a specific design. The time and thought put into each piece of gear is what makes Club Ride a leader in cycling apparel. Club Ride gear is not only stylish, it’s durable enough to hold up on the trail and comfortable enough to actually want to wear out on the town, too.